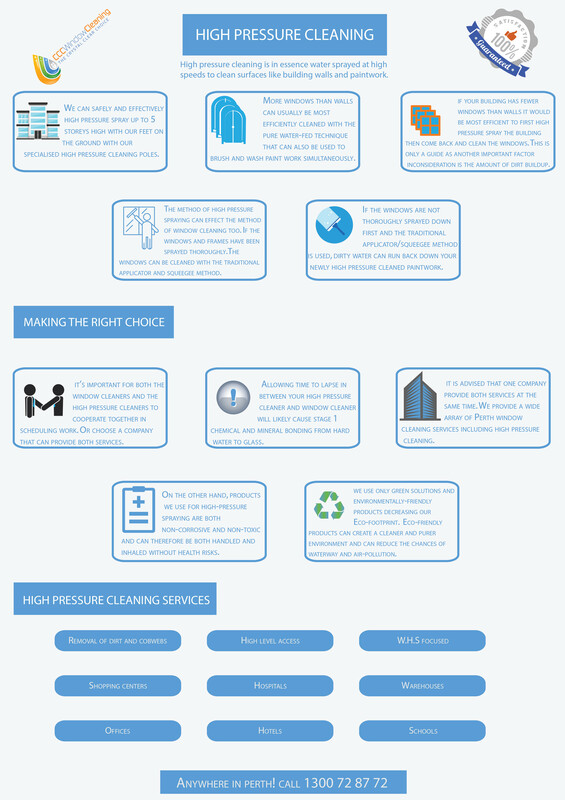 High Pressure Cleaning - Making the right choice. CCC Window Cleaning choose the best technique to leave both your building and windows spick and span. High pressure cleaning is in essence water sprayed at high speeds to clean surfaces like building walls and paintwork. A Karcher or other do-it-yourself high pressure cleaner may do the job for ground level work on a residential property but not for large commercial buildings of 2 stories or more. What is more, an industrial pressure cleaner has enough water pressure and velocity to strip paint work from a wall. For this reason, it’s vital to employ a reputable and professional high pressure cleaning service. Spraying the windows with a high pressure sprayer will leave the windows spotted and hard water used can over time stain the glass. Therefore, high pressure spraying a building necessitates window cleaning either way. For this reason, it’s important for both the window cleaners and the high pressure cleaners to cooperate together in scheduling work. Or a company that can take care of both high pressure cleaning and window cleaning can be employed. We provide a wide array of Perth window cleaning services including high pressure cleaning. Whether to high pressure spray or not depends on the wall to window ratio of your building. More windows than walls can usually be most efficiently cleaned with the pure water-fed technique that can also be used to brush and wash paint work simultaneously up to eight stories high. Using this technique can clean walls and paintwork and at the same time leave your windows and signs spot free. On the other hand, if your building has fewer windows than walls it would be most efficient to first high pressure spray the building then come back and clean the windows. This is only a guide as another important factor inconsideration is the amount of dirt build-up. Call us for a professional on-site assessment and proposal. The method of high pressure spraying can affect the method of window cleaning too. If the windows and frames have been sprayed thoroughly, the windows can be cleaned with the traditional applicator and squeegee method. If not, the windows are best cleaned using the pure water window cleaning method. This way the dirt is washed off the windows, frames, and the walls. 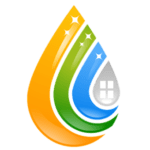 If the windows are not thoroughly sprayed down first and the traditional applicator/squeegee method is used, dirty water can run back down your newly high pressure cleaned paintwork. Removal of dust, cobwebs, stains, and more. *High pressure cleaning can be accomplished with our feet on the ground up to 3 levels via specialized high pressure cleaning poles. Higher can be achieved with the pure water reach and wash method or via suitable work platforms. *Spraying windows with hard water will lead to mineral buildup.